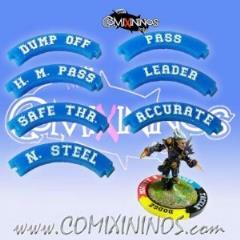 Fantasy Football item made by Comixininos. These Skills do not need any ring or accessory, since they perfectly fit arond the round 32 mm bases. All the Skills of the game are available at our store. You can combine them as you wish, since you can easily exchange them. No glue needed, because of their puzzle-connection system. The text of the Skills is laser engraved. The text has Fantasy Football format, with spikes all over the characters. You will need to combine 4 Skills to complete the whole circle around the 32 mm round base of your miniature. Since no glue is needed, once the game is over you can easily take out the skills from one miniature and use them for another miniature. Miniature is shown for reference and is not included.